Have a lot of custom wire binding to do? Then you should look into ordering some big spools of twin loop wire! Used with a large automated twin loop wire binding machine or cut by hand, a spool of wire gives you the option to have any length of wire for easy binding. We have 9 different colors to choose from, so you'll find something to compliment the cover and logo choices. And we have them in both 3:1 and 2:1 pitch, which can accommodate anywhere from 30 to 220 sheets of 20lb paper. And we carry Renz and GBC, the best in the twin loop wire business. 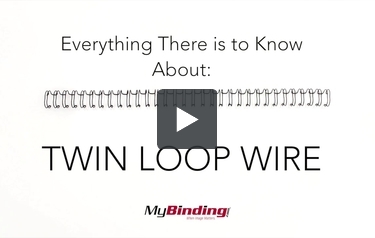 So don't let customization and quantity slow you down-get twin loop wire spools today!